When you first get married or enter any loving partnership you naturally expect to live a life of happily ever after. Your prince or princess is not supposed to fail you or get sick. But life is unpredictable. And when the person you love falls seriously ill, your fear can feel like a knife in the heart. Suddenly everything changes. The patterns and routines that give shape and meaning to day-to-day living dissolve into chaos, testing your emotional and physical strength. You wonder how you will ever get through this ordeal. I understand how devastated you feel. As a psychologist, I’ve helped couples deal with the impact of illness over thirty years of clinical practice. I know what it’s like to lie awake at three a.m. with your gut in a knot, anxious about what lies ahead (not to mention taking care of your partner right now). I know what it’s like to visualize to-do lists in your head and wonder if anyone will rescue you as you try to gain some semblance of control. During those long nights when you can’t sleep, you may even sob so deeply that you doubt you will ever make it to morning. My mission is to help you get through this tumultuous time, a time when you may panic or feel like you want to give up. 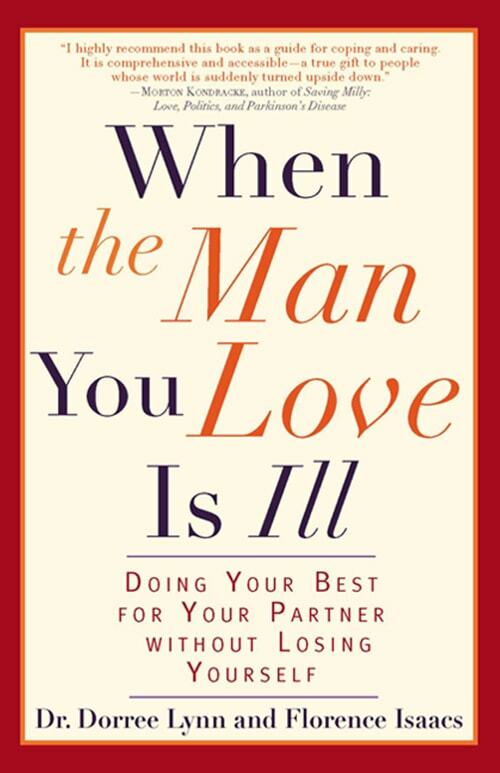 Clients who are struggling with a partner’s illness often ask me, “How do I cope?” I tell them that the most important thing to remember is that this time of change will not last forever. It is also an opportunity, a chance to be more authentic and real — the person you truly are — and to discover that you are stronger and more capable than you may have realized. If you can focus on that possibility, even though anxiety may be a constant companion right now, you will be amazed at what you can accomplish. That does not mean you have the power to change your loved one’s diagnosis or cure his/her illness. You can’t make his/her injuries disappear or restore his/her impairments; these feats are beyond your control. Nor does it mean you must be a perfect, ministering angel to a partner. Yet you can achieve something very important. You can learn to deal more effectively with whatever has happened and help your beloved get through it. You can be their coach and cheerleader and give one the practical and emotional support they need, even though you may feel like you’re falling apart. When you are taking care of an ill spouse, part of the challenge is finding help and hope without ever losing sight of reality. Too often, people go to the bottom line, thinking, “He or she will never be well again.” “Our life is over.” “They are going to die.” Perhaps in some cases, death is indeed imminent, but maybe there’s also a great deal of life to live before that happens. “This trial will never end,” you may think to yourself. In fact, nothing lasts forever. Emergencies do end. That’s part of their definition: they have limitations and evolve into something else where adjustment is possible. In the process of finding your way through your own situation, you’re going to have to deal with the complexities of an unasked for illness, the tasks that fall on you, and all the emotions stirred inside. Some feelings may stop you from reaching out and using available assistance. Yet asking for help is a necessity. I will steer you to resources for your needs and circumstances. There are not enough of them, and the demand for scarce resources will increase as the majority of Americans pass age fifty, putting them at increasing risk for heart disease, cancer, diabetes, and other major health problems. However, because of their pride or lack of knowledge, too many people fail to take advantage of what is available — often very close to home. When you’re running on empty and feeling lost, you can turn to this book for gentle guidance on how to cope. I’ll help you to become more aware and share with you the coping strategies that have worked for many couples I’ve treated. Much in our lives is – accidental – powerful events happen that you simply can’t control. But I’ve seen loving partners emerge stronger than they thought possible, and better than ever, even in the worst situations. You can, too. And along the way, you can forge a deeper, more meaningful relationship with the one you love.